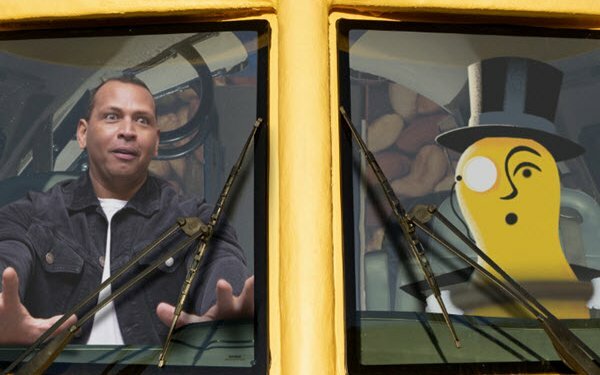 This morning, Planters released a Super Bowl LIII teaser video revealing that major league baseball legend Alex Rodriguez will mix it up with the brand’s smart-aleck mascot, Mr. Peanut, in this year’s big game ad. A still image released with the teaser video (above) hints that the game ad, created by VaynerMedia and set to air in the game’s second quarter, will not confine itself to a living room setting. Along with today’s Rodriguez reveal, Planters is indicating that the game ad shows the lengths to which Mr. Peanut is willing to go to give fans a “crunchy and satisfying” salty snack. The release also stresses the idea that Mr. Peanut “has your back,” which appears to be a conceptual extension of the brand’s 2018 “Wing Nut” campaign theme.